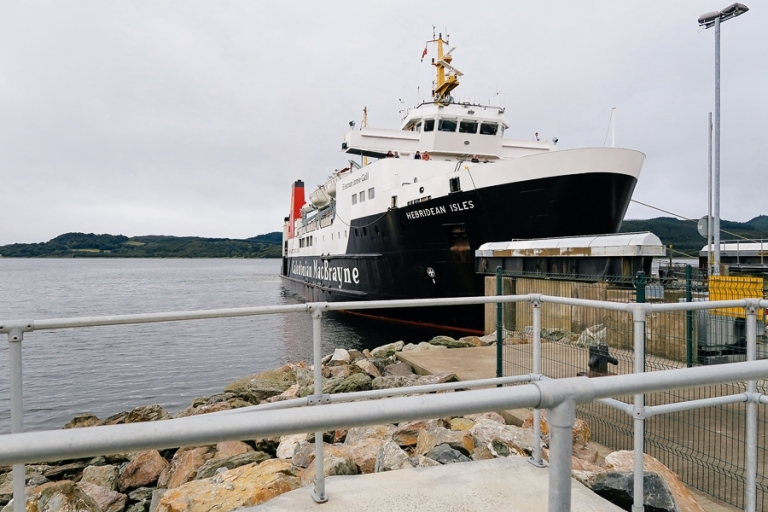 We arrived in Scotland via an early easyJet flight between Belfast and Glasgow, rented a car at the airport, and drove to Kennacraig Port to catch a ferry to Islay. 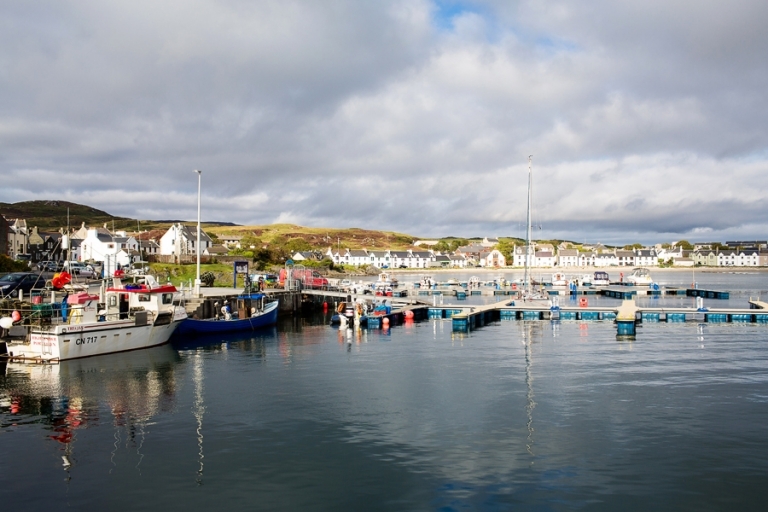 (It’s certainly an option to fly right to Islay, but we wanted to do the drive – it’s gorgeous.) If it sounds like it’s a lot of work to get to Islay, I won’t argue with that, but I can tell you it’s worth the effort whether you’re a whisky fan or not. I’ll get to the distilleries in the next post, but first I’ll honor the sheer beauty of Islay. The ferry ride over to Islay was nicer and comfier than I expected. 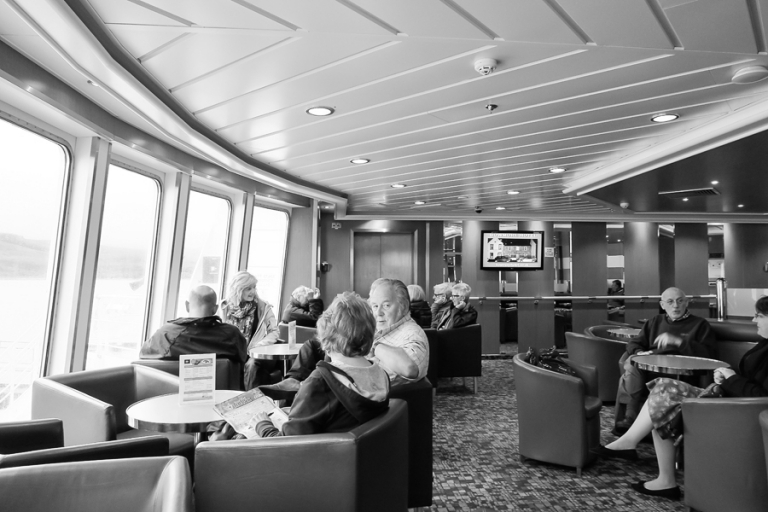 The Calmac boat looked like a small cruise ship with a restaurant, gift shop, lounge and casino on board. The ride took two hours in which we read in cozy chairs and enjoyed the rainy view from inside. When we arrived at Port Ellen, the rain cleared up just in time for me to get behind the right-side wheel to drive on the left side of the road. With whisky as our main purpose for visiting Islay, I promised Chris I would drive all weekend so that he could easily partake in sampling all eight distilleries. 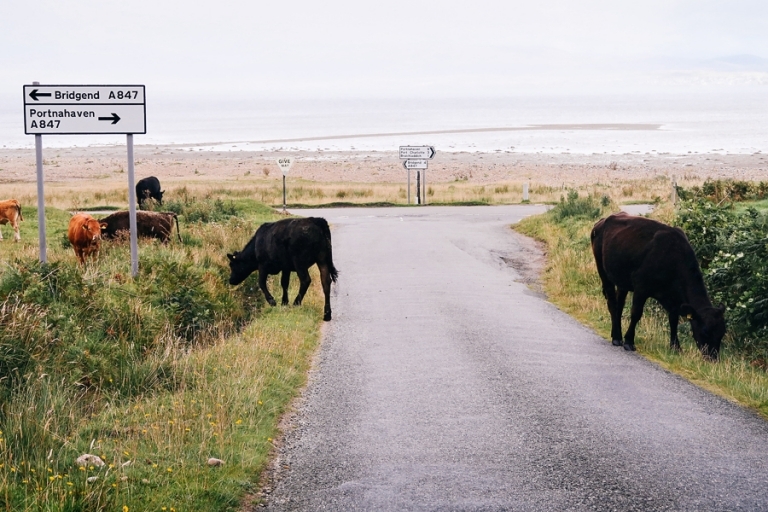 Driving on the island is easy enough; stay on the left and keep an eye out for the cows, sheep, and even peacocks. At one of our first must-see spots, Kildalton Parish, we stopped to see the Kildalton Cross, said to be the best surviving monolithic Celtic cross in Scotland. We also found a little baked goods stand called Cakes at the Cross where we enjoyed using the honor system to swap a few coins for some delicious baked goods. If you pop by and they happen to have the lemon drizzle cake available that day, I highly recommend it! And I’m not ashamed to admit I am as excited about lemon cake as I am about a centuries-old Celtic relic. What can I say? I like history and I like snacks. I actually didn’t have too many must-see items on our Islay list other than distilleries, but I wanted to explore as much of the island as possible in our three days. So between distillery visits we wandered the roads in our cute rental B180. We found gorgeous beaches and expansive stretches of green farmland. We chatted with locals and visitors, and tended to run into the same people over and over throughout the long weekend. Most of all, we found a peaceful laid-back atmosphere that only small island life can offer. …I found Highland cows for the first time! I was reeeally hoping to see sweet hairy coos on this trip despite not being in the Highlands, so I was excited to find them on Islay. They look surprised to see me! They’re curious little guys – they moseyed right on up to me at the fence to see what I was doing. So cute. The cows, and the island. Chris and I are already dreaming about going back someday. More on the Isle of Islay, specifically the distilleries of Islay and details about our accommodations, in the next posts!